For a blogger based in Delhi, there are not many opportunities to meet the well-known bloggers and gain insights about their work in the industry, So Delhi has however made it a little easier through their annual blogger conference or as they call it confluence. So Delhi returned with the third edition of the event on 5th of August and they made sure that the event is grander than the last one. The event’s host venue, The Lalit, New Delhi, Barakhamba Road, as usual, was the perfect place to accommodate all the bloggers and influencers arrived here from different walks of life. From the seating area to the dining area and from lighting to music, everything was on point. It was a hassle free process of registering and entering without any kind of confusion. What makes The So Delhi Confluence so important among the new and upcoming bloggers is that it is still an evolving career choice for many. Most of the blogging events otherwise are primarily focussed on ‘how to make money from your blogs and the technical aspects of getting paid.’ At The So Delhi confluence, you actually get a reality check on what seems like a convenient career choice may be the wrong path and one needs to stop and reanalyze their strategy. I was travelling in Spiti Valley on 1st of May, still making my mind if I should go to Delhi and attend the Confluence or not. For someone who is tucked in a corner of the country, chilling in the mountains, talking to the cute pahadi dogs, it was a tough choice to travel all the way to Delhi and attend the event. I had to leave Spiti because of sudden rains and flooding of Losar River that made it impossible to travel to nearby places. I had nowhere to go but to return to Delhi. 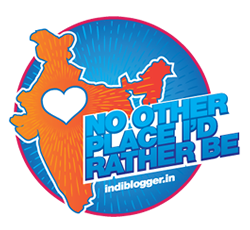 And so I ended up in Delhi attending the biggest bloggers meet of the city and may be the country. It was a wonderful experience getting face to face with some of the industry big timers and the ones who have been an inspiration for many. When I entered the venue, the panel discussion on ‘How to get paid for your travels’ had already started. The event was hosted by Mr. Ajay Jain, the founder of of Kunzum where I have spent hours and hours of my life consuming their free wi-fi working on my blogs and editing my pictures. This was the first time when I saw Ajay speak in public and it was amazing. Himanshu Sehgal from MyYellowPlate, Phillipa Kaye from Memsahib In India and Ajay Sood were part of the panel and they gave some valuable insights on the future of travel blogging and how one can make it a full time career. From Ajay Jain to Naina Redhu and from Sahiba Gursahaney to Ssumier Pasricha, everyone made one thing clear. If you want to succeed in the future of blogging, whether it is a written content, a photo story or a video, the content needs to be focussed upon. Without good content, it is simply impossible to find success in the field you are trying to gain recognition. This time, the number of fun activities at the venue was increased. Bloggers showed a lot of interest at Beer Pong by Sangam Courtyard. At the same time, many were seen playing the beer themed Happy by Thirsty’s wheel of fortune. I even won myself a little discount voucher at Sangam Courtyard’s table. I personally liked the session on ‘Going Viral with Pammi Aunty’ by Ssumair R. Pasricha and later ‘Monetizing Content: How to Price Your Post’ moderated by Naina Redhu. These two were fun sessions in their very own ways. While Ssumair described his work as something that he didn’t start with the intention of going viral but it just happened. The entire session was filled with his funny experiences with his fans, family members and about his work preferences. The conclusion of his session was that if you start doing something because others are doing it, you are bound to fail. Do what you like and give your best. Session on monetizing content was another fun panel where some of the established bloggers like Juhi Godambe, Mehak Sagar, Anjali Batra and Pallavi Chaturvedi talked about their ordeal with brands and payment processes. It was interesting to know how brands try to manipulate you when it comes to payments and how it is important to keep a track of what other bloggers are being paid. The best part of the session was undoubtedly by Shivya Nath. A lot of travel bloggers were looking forward to her session on responsible blogging. She started with a short video on sustainable living at The Goat Village in Uttarakhand. She took it further towards how bloggers in their respective fields can bring a change through their blog and content. For a blogger, it is important to connect with other bloggers and Shivya made it happen. Something that I don’t like about Blogger events, is that doesn’t matter what the session is, it ultimately becomes a talk show on how to earn from your blogs. While the event management itself tries to control it by making the session multithemeatic, it is the guests who end up asking a question or another revolving around the same topic. ‘How to get hits on my blog’ or ‘how do you manage money for your travels’ are a few of the questions that kept bumping up during the entire event. While that is not wrong and the ultimate agenda of every blogger is to earn, it is more important to relate with the theme of the session and the people who are talking about their experience rather than alienating them from the topic. When So Delhi’s Confluence returns for the next year, I would like to see more involvement from brands and more networking opportunities. Also, I would like to see a less crowded food stall with fewer items in the menu. For one thing, I know is that So Delhi surpassed itself with the event and next year they’ll return with more surprises up their sleeves.